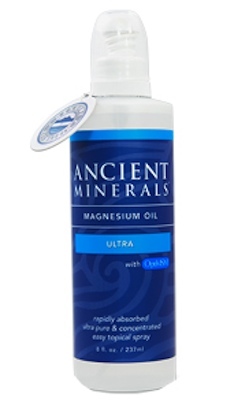 Magnesium oil is a versatile tool of health providing benefits that show up in your skin. When you use magnesium oil on a regular basis you feel more relaxed. You are more resistant to stress, and less likely to suffer the symptoms of depression or anxiety. A long list of health conditions, from diabetes to joint pain, slowly improve when you use magnesium oil. And sometimes the effect on general health is so great that people notice their skin just glows. But there are also specific cosmetic benefits of magnesium oil for your skin. The first thing to understand about magnesium oil is that it really is not an ‘oil’. It is a concentrated solution of naturally occurring mineral salts, including magnesium chloride, naturally mixed with water. There are so many beneficial minerals in magnesium oil that it feels slippery, and it will tend to stay on your skin, but it will never clog your pores. To the contrary, magnesium oil will help open them. Clogged pores are often blocked by tiny flakes of dead skin, too small to be observed by the naked eye. These microscopic flakes dull the luster of your skin, forming an invisible layer over the vibrant, still-growing skin beneath them. When you apply magnesium oil to your skin, some of the minerals in the oil cross into your skin to nourish it and the tissues beneath it, but some of them desiccate dead skin even further. The application of magnesium oil breaks up the protein ‘glue’ that keeps dead skin on the surface, so that when you rinse off the dried salt, you rinse off dead skin flakes along with it. The result is healthier skin with pores that are more free to drain sebum, keeping them from forming whitehead’s that turn into blackheads and pimples. Acne is sometimes described as diabetes of the skin. That doesn’t mean that everyone who has acne has diabetes or that everyone who has diabetes has acne, but one of the mechanisms that keeps acne-affected skin red and irritated, is the stress hormone cortisol. Your skin responds to stress hormones made by your adrenal glands, but it also makes stress hormones on its own. The skin’s production of its own stress hormones is higher when your blood sugar levels are higher. Once formed in the skin, cortisol activates a process that releases histamine, and the histamine keeps your skin red around pimples and papules. It’s always better for your skin, to cut out the sweets, to eat fewer simple carbohydrates and sugars. But while you are waiting for your changes in diet to have an effect, provide your skin with magnesium. You can get magnesium for your skin from supplements you take orally, but the skin has to share that magnesium with the rest of your body before it receives its own supply. And there is a side effect of taking magnesium orally, which is that it likely to give you the runs! Applying magnesium oil directly to your skin provides it with its needed magnesium first, which it then shares with the rest of the body once the mineral reaches the blood vesselsbeneath the basal layer, the skin-regenerating layer, at a depth of about 25 cells below the surface. Dead skin does not just clog pores. It can also anchor the edges of fine lines and wrinkles. Any kind of exfoliation (removal of dead skin) can reduce tension on the edges of wrinkles so that they smooth out and are less noticeable. Sometimes a line or wrinkle will completely disappear. Alpha-hydroxy acids are more effective for exfoliation than magnesium oil, we have to admit. But magnesium oil will nourish the skin and help it grow faster, restoring color at the same time it helps you smooth your skin. And if you have sensitive dry or oily skin, magnesium oil may be what you need to prevent the formation of blemishes that can occur when you use exfoliants that are too strong. If you have natural golden or dark brown skin tones, chances are you are less concerned about acne or allergic sensitive skin reactions, than the way your skin changes color when it heals. The pigment melatonin (which comes in golden and brown and black shades) does not just give skin its color. It also serves as an antioxidant that quenches inflammation after the skin is injured. Many people who have beautiful, colorful skin tones barely show pimples or sunburn, but then develop brown or black spots in the skin as it heals. The most important thing you can do to prevent brown and black spots in your skin is to cover up with sunscreen or floppy hats when you have any kind of inflammation in your skin. The combination of inflammation and sun exposure puts melatonin production in some skin types, into overdrive. But the second most important thing you can do when you suffer any kind of injury to your skin is to use magnesium oil. Magnesium is essential for the formation of enzymes in ever cell in the body, including the skin. Every enzyme in your skin needs to keep its inflammatory responses to the sun or infection from running wild, so it requires magnesium. The enzymes that stimulate the growth of healthy, normally pigmented skin in its lower layers require magnesium. And if there is any important mineral in which you are likely to be deficient, it is magnesium. Just a dab of magnesium oil on inflamed skin at night will help protect it from discoloration from sunlight during the day. If you happen to have Asian skin tones, that’s exactly what would be suggested at a spa, although they might combine magnesium oil with pulsed light therapy for greater effect (the right wavelengths of visible light counteracting the detrimental effects of ultraviolet light). Don’t try to use magnesium oil underneath makeup. It just won’t work. And don’t apply magnesium oil as a ‘wash’. The oil needs to stay in contact with your skin at least half an hour, preferably up to eight hours while you sleep, so it can be more completely absorbed. Applying magnesium oil on other parts of your body may also help, but not as much as applying it directly to areas of inflammation. Some people who have sensitive skin report a little burning or stinging when they use magnesium oil. That isn’t because there is anything in the oil that actually burns the skin. That is because it is highly concentrated salt water. The solution is simple. Just dilute the magnesium oil solution with water. Because magnesium oil is really a concentrated water solution, it is completely soluble in water, although you could also add it to cold cream. Shaikh ZI, Mashood AA. Treatment of refractory melasma with combination of topical 5% magnesium ascorbyl phosphate and fluorescent pulsed light in Asian patients.Int J Dermatol. 2013 Oct 29. doi: 10.1111/ijd.12195.